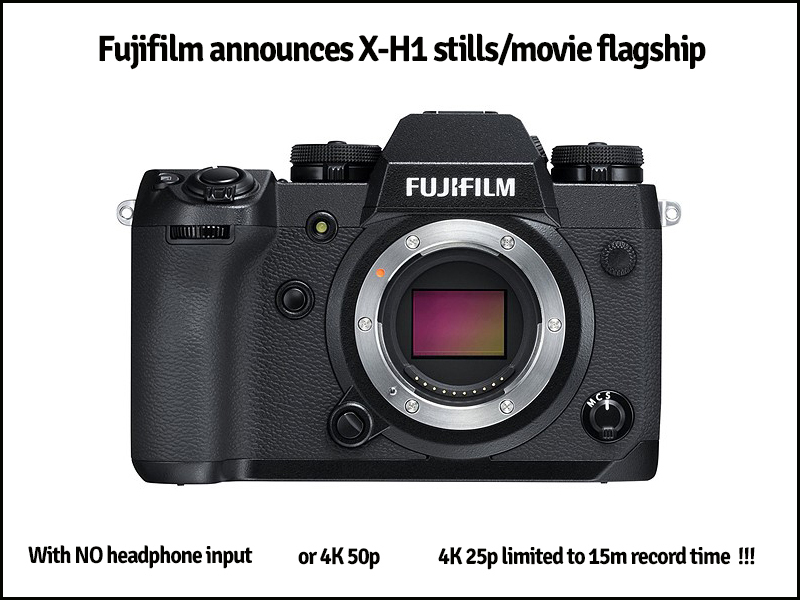 HD Warrior » Blog Archiv » New Fuji X-H1 stills/movie flagship ! You do know that the headphone jack and extended 4k recording time is included in the optional battery grip, right? Personally, I get the idea – if you just want some simple clips with a smaller body and you don’t need professional audio then don’t include the battery grip. But if you need longer recording and to monitor the audio, do use the battery grip. At least there are options and there is no sign of overheating like the small Sony cams. Panasonic is using a smaller sensor, so perhaps less processing requires less heat dissipation? My bigger gripe about just about all “video centric” cameras is this daft 29 minute cutoff that renders them all just about useless for longer interviews and especially for recording conferences. This is all about some kind of European photo vs video tax, right? Well at least give us the option to pay the tax and break through the 29 minute barrier! Like some kind of upgrade option. My second gripe about all “video centric” DSLRs of any flavour is their complete lack of ND filters. The moment you walk outside, there goes the “video centric” nature of all of them. IMO the camera that is absolutely begging to be turned into a video centric tool is the X100 range – that just so happens to include an ND filter. And an ND filter, as it turns out, that does not work in video mode! Sure, these cameras are fixed focal lengths, but they do include a wide converter and a 50mm converter that make them pretty much ideal for most video focal lengths. One video centric, ND filter enabled, long recording X100 series camera, two “prime” converters and some kind of XRL audio solution and you have a very competent and affordable rig. Surely I’m not the only one that thinks ND filters are the missing link between affordable “video centric” cameras and real video cameras that provide NDs and better audio. HDW : I am not so keen on having to spend money on a grip just to extend the video features but at least they have this as an option. By stating that the camera is utterly useless for movie making hence it does not have audio monitoring option or extended recording times you do realize that most of the movie cameras share this lack of features. By stating this lets remember that a film cameras recording time is limited to loaded cartridge, so a camera that shoot movies on film is an utterly useless movie camera. Video/Tv cameras do require longer record times and audio monitoring options but movie cameras do not. When shooting a moving you will end up using a mattebox with the prime lenses you shoot with, a mattebox with ND filters. Also movies are shot at 24fps so why would you need 50fps for shooting movies? HDW : This is not a MOVIE camera for shooting MOVIES its a stills camera with video features. 15m is very much a limitation when you can buy a camera like the Panasonic GH5 with NO time limitation. I am not comparing this to a cine type camera. 24p is used in MOVIES but thats a legacy because 24fps was the only frame rate available in those days. Its hard to consider a more videocentric camera than GH5/S. Not just those time limitation, but they missed 4.4.2 and 10 bit. Not to mention a proper articulated screen and others.